After taking the prepaid and postpaid data industry by storm, Jio is plotting yet another revolution in the broadband segment with the introduction of its Jio GigaFiber services. With the coming of the latest fibre optic technology in the country, gone are the days when it was considered too expensive to be deployed for household use. Now, new service providers are adapting to the latest times, and Reliance Jio is also not missing out on riding this bandwagon. 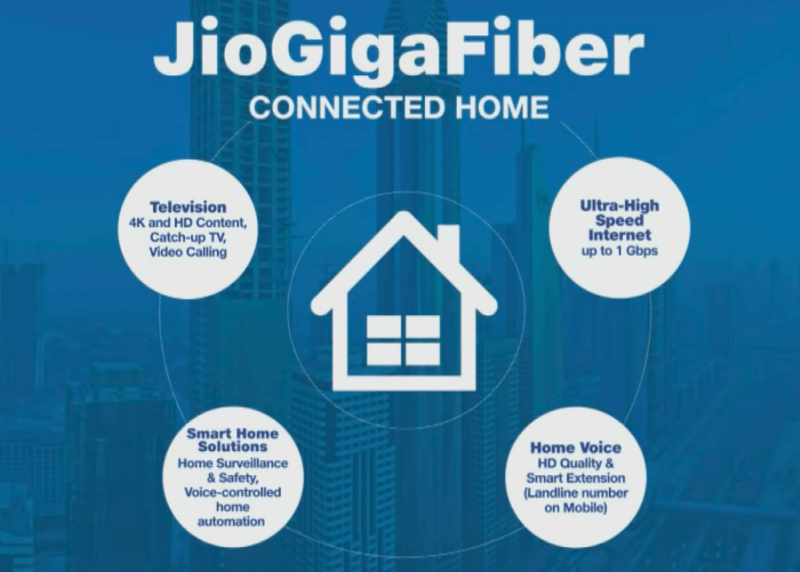 As the name implies, Reliance Jio’s GigaFiber broadband service will be based on fibre optic cable, meaning that it will use the photosensitive technology for data transfer facilitating ultra-high speeds which are not otherwise possible on traditional broadband lines. To the subscribers who will opt for Jio GigaFiber, Reliance Jio promises 1Gbps speed. 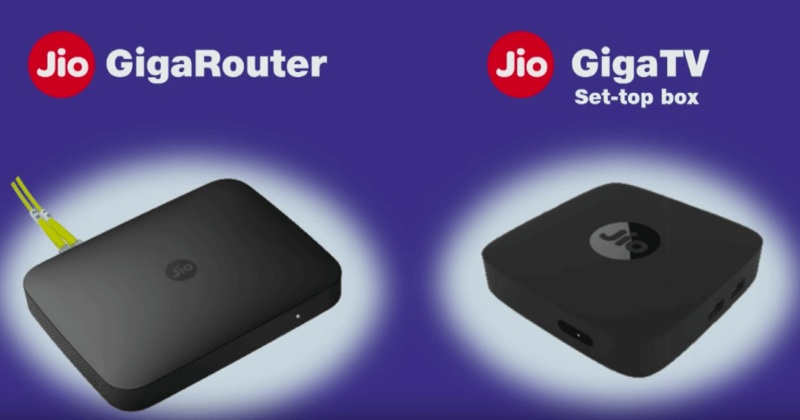 To make the high speed 1Gbps broadband connection possible in the households, Jio will be installing Giga Router at homes which will avail the ultra-high-speed internet connection for the subscriber’s usage along with wall-to-wall high-speed Wi-Fi connection. Reliance Jio will also be bundling a GigaFiber dependable service called the GigaTV for its subscribers. Using the GigaTV, users will be able to access more than 400 channels, unlimited movies and other content which Jio apps offer. The GigaTV service will be facilitated by a GigaTV set-top-box which will be similar to the set-top-box which users use with their TVs now. Reliance Jio will also bring a host of other services which will accompany the Jio GigaFiber connection. The Mukesh Ambani led telco will also work on its promise of connecting people across the country by facilitating HD video calling using the GigaTV. Using the video calling feature subscribers will be able to place video calls to other GigaTV users and smartphone users as well right through their television screen. In addition to video calling, Reliance Jio has also boasted of a virtual reality headset which subscribers can use to experience augmented reality, 360-degree videos and other VR based content right from the comfort of their living room; this again will be dependable on the Jio GigaFiber and GigaTV STB. 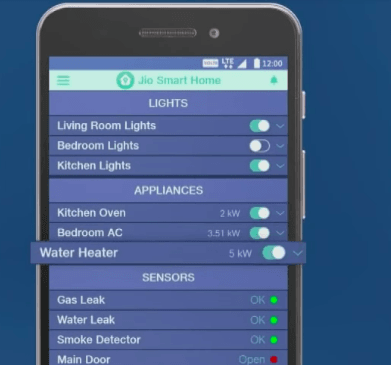 Additionally, Reliance Jio will also bring an entire range of Home Solution products for the users. These products will be based on IoT (Internet of Things) technology and will help the users in converting their home into smart homes thus increasing security and protection in their premises. The line-up of Smart Home solutions by Reliance Jio will include Audio dongle, video dongle, smart speaker, Wi-Fi extender, smart plug, outdoor CCTV, TV camera, indoor camera, smoke sensors, sirens, IR blasters, gas leak sensors and more. Overall, Reliance Jio is planning yet another technology revolution in the country, except this time instead of the mobile network, the change will impact entire households. In the coming days, the Mukesh Ambani led telco will establish its stronghold not only as a telecom operator but also as a tech giant. It remains to be seen, how the Indian consumers adapt to Reliance Jio’s rollout of GigaFiber and its other related services. And according to you Airtel which gives 24KB/s speed is no1 LTE network of the world? Your company Airtel is burning its back due to Jio giving speed to most people. where is airtel who charged 75 rupees for 75 mp of data for voice over the internet.